Good day! And welcome to the Better-Late-Than-Never edition of the November APLS Carnival! Although originally slated for posting on the 15th, we pushed back both the submission and posting date two days, to allow those of us who were thoroughly wrapped up in all the pre- and post-election hoopla enough time to get organized. This month’s topic is “Buying Local”, a timely subject considering the holiday season is upon us. Many of us will be sourcing out foods for our gatherings and gifts for friends and family in the next few weeks. How do we determine when to purchase locally? Let’s see what a bunch of folks a lot smarter than I had to say about it. Donna at Chocolate Crayons and More tells how a former Walmart enthusiast has turned her back on the megastore in an attempt to avoid the hidden costs and social injustices associated with buying from the big chains. Robbie at Going Green Mama discusses how our uncertain economy brings opportunity for all of us to invest in our neighbors. 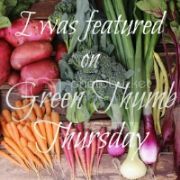 Heather at Simple-Green-Frugal is talking about the food aspect of buying local and reminds us that local foods don’t just taste better, they are better – more nutritious and generally less damaging to the earth. And while it can be difficult to commit to a 100% local diet, she reminds us to be mindful of our choices. Jena at Married to the Farm leaves the philosophical arguments to others and gives us nine easy steps that can help anyone interested in shopping locally to get started. Brandi at Organic Needle sews up a holiday quilt of green, kinda green, and not-even-close-to-green holiday gifts. And she threatens Santa Clause too. Elves take note. Alline at Ecovillage Musings talks about the local shopkeepers that make life a little easier (and a bit nicer) for those who patronize their stores. Erin at The Conscious Shopper gives us a glimpse at her personal philosophy behind eating local: Conscious Eating. It is a simple and succinct set of ideals that can be used as a litmus test to gauge the mindfulness of food purchases. Abbie at The Farmer’s Daughter delves into the “Real vs. Fake” Christmas tree issue and offers some great insight from a former family tree farmer. Tina at crstn85 laments the fact that she is living in a town where the megastores have already taken over and there are very few options left for shopping local. Green Bean at Green Phone Booth also grieves the loss of local mom and pop shops in her post “Monoculture”. Sara at Your Green Review argues that local food is not necessarily any more environmentally friendly than the 1,500 mile pineapple you’re shunning. She reminds us that making eco-friendly food choices involves more than just tracking transportation miles. Viv at Kneedly Knots does a better job of summing herself up than I could. “Buy local whenever possible... balance the books at all levels....and don't use credit inappropriately” Sensible advice, Viv. Michelle at Leaving Excess, a self-proclaimed neophyte when it comes to buying local, is struggling to get on a CSA list and is just starting to navigate the waters of locavorism. Let’s give her some encouragement! Daphne at Daphne’s Dandelions, a crafter in the Boston area, tells us what life is like from the other side of the local, hand-made economy. Karen at Goose Juice puts her money where her mouth is and continues to buy local, much to her father’s chagrin. Devin at Quince Urban Homestead discusses how “buying local” can range from a 100-mile radius during Minnesota’s warm summer month to a continent-wide dragnet during the bleak winter. Beth at Fake Plastic Fish compares “local” with “community” and argues that they are not as synonymous as one might think. Thank you so much to everyone who took the time to participate in this month’s APLS carnival at the Green Phone Booth. I had a great time reading all of your posts and really appreciated all the different points of view that were expressed. I hope you’ll join us again next month when Robbie at Going Green Mama will be covering the topic “Children are our most valuable natural resource”. Be sure to check the APLS blog for updates! Some GREAT advice, tips and tricks in there. Thanks for putting it all together! Excellent! I hope to have some time later today to read all the submissions. Maybe next month I can get back on the bandwagon and submit again... Thanks for doing this! Great website resources. Thanks for the green tips.